The Flamenco Mass adapts melodic and rhythmic nuances from the flamenco heritage to the texts of the Liturgy which are in turn transcribed into rhyming songs with simple, direct language. It is introduced by a siguiriya. Heard in the open spaces of the street or the public square the siguiriya sounds like a song of the Islamic muezzin. 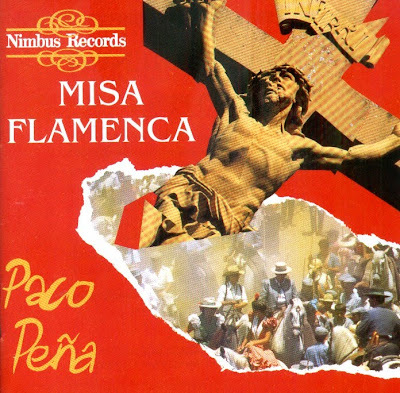 It is a particularly fitiing comparison in the context of this Flamenco Mass, and a close association can be made with the 'call to prayer' that used to fly through the air from the minarets of the mosques of Córdoba, Málaga and Granada in broken and wavering guttural voices, rough-edged and strong, with melancholic turns that later, in flamenco, become an expression of suffering. The voice of the muezzin or the pealing of church bells, both represent the call to a universal rite, one which in times past would have seemed appropriate within the enironment of an Andalucían mosque, where Moslems, Christian and Jews once prayed together. The CD was released by Nimbus Record, 1991, (DDD). NI 5288. Flamenco Singers: La Susi, Rafael Montilla "El Chaparro", Dieguito, Antonio Suarez "Guadiana"